In 1999 a civil trial jury found that Loyd Jowers participated in a conspiracy with the US state to kill Martin Luther King. Even though Martin Luther King is world renowned, the results of this trial are still not widely known and probably few Australians have any idea of the truth. The man officially convicted of the assassination, James Earl Ray, died in jail. The civil trial exonerated him. Successive governments had refused to reopen his case. Part of this remarkable story is about the efforts of the King family and friends to bring about a thorough investigation and the absolute recalcitrance of the US government. Martin Luther King was shot and killed by a sniper on 4 April 1968, while standing on the second-floor balcony of the Lorraine Motel in Memphis, Tennessee. James Earl Ray was charged with King's murder and confessed on 10 March 1969, but then recanted three days later. He was sentenced to 99 years prison. Ray later claimed to have been talked into the guilty plea by his lawyer, in order to avoid the possibility of the electric chair. Members of the King family and friends, notably Dr William Pepper, made unsuccessful efforts to obtain a retrial for Ray. Pepper actually represented Ray in a mock trial on television. Ray died in prison on 23 April 1998, at seventy years of age. He had his ashes buried in Ireland because he did not wish to be buried in the United States because of the injustice he had suffered. The King family has since concluded that Ray did not have anything to do with the murder of Martin Luther King. You can read a transcript of their press conference to that effect, summing up the outcome of the trial. This historic trial was so ignored by the media that, apart from the courtroom participants, I was the only person who attended it from beginning to end. What I experienced in that courtroom ranged from inspiration at the courage of the Kings, their lawyer-investigator William F. Pepper, and the witnesses, to amazement at the government's carefully interwoven plot to kill Dr. King. The seriousness with which US intelligence agencies planned the murder of Martin Luther King, Jr. speaks eloquently of the threat Kingian nonviolence represented to the powers that be in the spring of 1968. It may also be of interest readers of http://candobetter.org site to know that our article about King's attitude to family planning is among our most visited ever. King was certainly a popular man with a transforming vision which has retained enormous power to inspire. This little article has been written using notes from candobetter editor and writer, James Sinnamon, plus the articles linked to above, but I am also grateful to wikipedia for two articles and photos on their sites about Loyd Jowers and James Earl Ray. What was James Earl Ray's involvement? Ray later claimed to have been talked into the guilty plea by his lawyer, in order to avoid the possibility of the electric chair. I wonder what he was guilty of? If we was completely innocent surely he wouldn't have been talked into pleading guilty. It seems that he was already serving 20 years for armed robbery, but escaped from prison. He was caught trying to leave the country and brought back and charged with the crime. The later investigations by the King family showed that someone else killed King, so that J.E. Ray could not have. He is said to have pled guilty on the advice of his lawyer, even though he was not, in case he was found guilty (despite his innocence), in which case he would risk the electric chair. It doesn't really matter if he was 'guilty of something'; the point is that he wasn't guilty of that crime. Whilst some people might think that his other crimes may have made him fair game, one of the problems with that view is that it means that the real perpetrator escaped. Since the whole thing seems to have been shown beyond doubt to have been a US government organised conspiracy, that makes the crimes against James Earl Ray all the worse - to say the least. J.E. Ray said that he might have inadvertantly done something to help people in his family to assist with the assassination, but that is not what he was on trial for and I don't know any more about that aspect of the story. It seems odd that, even if his brother or other people had been involved partially in the conspiracy and Ray knew something about it, no-one tried to find out more or to convict more people. The state preferred the lone, mad gunman story and the state knew the truth. That's pretty scary, isn't it, because, if the US government conspired to assassinate King and forty years later it hasn't been overturned in disgrace, what does that say about the way we live? 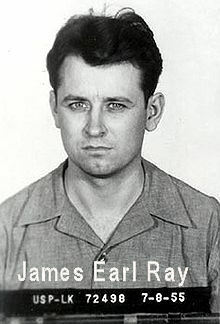 James Earl Ray came from a poor family in Alton, Illinois, and left school at age fifteen. He joined the US Army during World War II and served in Germany. He was convicted of his first crime, a burglary in California, in 1949. In 1952 he served two years for armed robbery of a taxi driver in Illinois. In 1955, he was convicted of mail fraud. After an armed robbery in Missouri in 1959, Ray was sentenced to twenty years in prison for repeated offenses. He escaped from prison in 1967 by hiding in a truck transporting bread from the prison bakery. On 8 June 1968, a little more than two months after King's death, Ray was captured at London's Heathrow Airport while trying to leave the United Kingdom on a false Canadian passport. At check-in the ticket agent noticed the name on his passport was on a Royal Canadian Police watchlist. He was using the name of Ramon George Sneyd. At the airport, officials noticed that Ray carried another passport under a second name. The UK quickly extradited Ray to Tennessee, where he was charged with King's murder. He confessed to the crime on 10 March 1969, although he recanted this confession three days later. After pleading guilty he was sentenced to ninety-nine years in prison. Ray entered a guilty plea on the advice of his attorney, Percy Foreman, in order to avoid a potential trial conviction, which could have led to a sentence of death. The method of execution in Tennessee at the time would have been electrocution. Ray fired Foreman as his attorney and derisively called him "Percy Fourflusher," thereafter. Ray began claiming that a man he had met in Montreal, who used the alias "Raoul", had been deeply involved, as had his brother Johnny, but that he himself had not. Instead he asserted that he did not "personally shoot Dr. King," but may have been, "partially responsible without knowing it," hinting at a conspiracy. He spent the remainder of his life attempting unsuccessfully to withdraw his guilty plea and secure a trial. On June 11, 1977, Ray made his second appearance on the FBI Most Wanted Fugitives list, this time as the 351st entry. He and six other convicts had escaped from Brushy Mountain State Penitentiary in Petros, Tennessee on June 10, 1977. They were recaptured on June 13, three days later, and returned to prison. A year was added to Ray's previous sentence, to total 100 years. Shortly after, Ray testified before the House Select Committee on Assassinations that he did not shoot King. In 1997, King's son Dexter met with Ray, and publicly supported his efforts to obtain a retrial. Loyd Jowers, a restaurant owner in Memphis, was brought to civil court and sued as being part of a conspiracy to murder Martin Luther King. Jowers was found legally liable, and the King family accepted $100 in restitution, an amount chosen to show that they were not pursuing the case for financial gain. Dr. William Pepper, a friend of King in the last year of his life, represented Ray in a televised mock trial in an attempt to get him the trial he never had. Pepper later represented the King family in a wrongful death civil trial against Loyd Jowers. The King family has since concluded that Ray did not have anything to do with the murder of Martin Luther King. Ray died in prison on 23 April 1998, at seventy years of age, from complications related to kidney disease and liver failure caused by hepatitis C. He probably contracted the disease through a blood transfusion given after he sustained a stabbing while at Brushy Mountain State Penitentiary. Ray was survived by seven siblings. His brother Jerry Ray told CNN that his brother did not want to be buried or have his final resting place in the United States because of "the way the government has treated him." Ray was cremated and his ashes were flown to Ireland, the home of his family's ancestors. "Pepper was the attorney for James Earl Ray, who pled guilty to killing Martin Luther King, Jr.. After conducting his own investigation into the assasination of his friend Pepper agreed to represent James Earl Ray once he had convinced himself that James was innocent. He believes that Ray was framed by the federal government and that King was killed by a conspiracy that involved the FBI, the CIA, the military, the Memphis police and organised crime figures from New Orleans and Memphis. Pepper represented James Earl Ray in a televised mock trial in an attempt to get Ray the trial that he never had. Ray was found not guilty. Pepper then represented the King family in a wrongful death lawsuit, King family vs. Loyd Jowers and "other unknown co-conspirators." During a trial that lasted four weeks Pepper produced over seventy witnesses. Jowers, testifying by deposition, stated that James Earl Ray was a scapegoat and not involved in the assassination. Jowers testified that Memphis police officer Earl Clark fired the fatal shots. On December 8, 1999, the Memphis jury found Jowers responsible and found that the assassination plot included also "governmental agencies." The jury took less than an hour to find in favor of the King family for the requested sum of $100." I thank Sheila for having raised this critical issue. The four most charismatic, effective and incorruptible leaders of the 1960's -- President John F Kennedy, Malcolm X, Martin Luther King and Robert F Kennedy -- were all murdered. Those who refuse to believe that these four murders could have been just a coincidence are baited by the establishment as "conspiracy theorists". THERE are still questions to be answered about the untimely death of pop singer Michael Jackson and I suspect these questions will continue to be asked long after he has been laid to rest. The reason is that all the ingredients are gelling for a grand conspiracy theory. To bake a delicious conspiracy theory, here's what you need: Take a celebrity with global fan appeal but make sure your candidate is aged between 33 and 50 (any younger and they haven't amassed the fan base necessary to incite hysteria after death; any older there's a diminution of the feeling of being robbed by their death). There's no "injustice" in an 80-year-old dropping dead. The article then goes off to raise other conspiracy theories such as those surrounding the death of Princess Diana, the disappearance of Australian Prime Minister Harold Holt and Elvis faking his own death. It is as if Salt means to imply that all conspiracy theorists unquestioningly accept each and every one of these theories. But if you really want to create the perfect conspiracy theory, then have a celebrity power figure, say a 46-year-old US president, assassinated in public. And then have the whole thing captured on a single movie camera operated by a middle-aged man with an exotic name such as, oh I don't know, say Abraham Zapruder. Other conspiracy theories question the motives behind global events: the bigger the event the greater the market for an elaborate theory. Salt's supposed humour appears to be an intellectually cowardly way of avoiding discussing the evidence. One of many pieces of evidence that proves that Oswald could not have killed Kennedy or, at least could not have killed Kennedy acting alone is to be found on the very film by Abraham Zapruder that Salt alludes to. That evidence is that the fatal shot pushed Kennedy's head backwards and not forwards --- a physical impossibility if the shot had come from behind Kennedy from the Texas Book repository from which Oswald was alleged to have fired the fatal shot. It seems that those who like to bait JFK assassination theorists avoid mentioning the other assassinations, particularly that of Martin Luther King. In part this is because a jury trial found that there was a conspiracy to murder Martin Luther King, as Sheila has shown so it is not nearly as easy to dismiss them. Also, it is because it can be implied (falsely) that President Kennedy was corrupt and tainted by power merely because he held high office and therefore either he somehow got what he deserved anyway or at least his death was no great loss. One who argues the latter is the supposed dissident American intellectual Noam Chomsky. The same cannot be so easily said of Martin Luther King. I attempted to post he following in response to John Quiggin's article, MLK and non-violent protest, but my comment vanished without trace after I hit the "Submit Comment" button. I didn't even see the usual "Your comment is awaiting moderation" notice. I will try again to submit this comment at a later point. John Quiggin had posted at least three articles in support of NATO's war against Libya: All necessary measures of 18 March, The end of tyranny of 23 August and The just fight not fought of 14 September. Some posters challenged John Quiggin's support for the invasion of Libya. There was debate in which John Quiggin's logic did not seem to stand up. He certainly failed to produce the evidence that he was asked for in support of his claims. After that debate John Quiggin has fallen silent on these questions in a fashion similar to larvatusprode.net and WebDiary which have not even mentioned those conflicts. Webdiary has a stated policy of not conducting further discussions on the causes of the 2003 Iraq War or (unofficial) "9/11 conspiracy theories". That policy now seems to embrace discussion of any war that Australia is involved in or which the Australian Government supports. Martin Luther King once said: "There comes a time, when silence is betrayal." Whilst silence is preferable to publishing misleading articles, I don't think Martin Luther King would be too impressed with the curious silence that has descended over Australian political discussion forums concerning the ongoing crimes which are being committed against Libya and the crimes which are being threatened against Syria, if he were alive today. civil trial in 1999 found that James Earl Ray had been framed for King's murder and that King had been killed as a result of a conspiracy by the US Army and the Memphis Police Department. (12:03PM, 21 October 2011) My second attempt to post the comment to the above forum page similarly failed. How this could have happened unless John Quiggin was intentionally blocking posts by me is beyond me. Paradoxically, advocates of non-violent protest can also play a role in causing deaths; deaths of their own followers. That too is a kind of collateral damage. Even the most extremely doctrinaire and naive practitioners of "non-violence" are unlikely to have caused nearly as much harm to their followers as those who advocate violent tactics in a society such as our own so easily could. Although Australia's formal democracy only rarely translates into "Government ... for the people by the people" as, for example, the privatisation of Telstra and Australia's participation in the illegal invasions of Iraq and Afghanistan, etc., etc. show, our circumstances could easily be a lot worse. We still have the right to vote out governments we don't like, and (in practice, if we don't read the fine print of the legislation too closely) the right to free speech and to protest. Committing illegal acts of violence, when we still have those rights could well give our secret government the excuse it needs to take away those rights. So, I think it is safe to assume that anyone who advocates violent tactics in support of progressive causes in Australia is either an agent provocateur or stupid. 1. What you can do: Consider posting to that page a complaint against apparent censorship on that site. Include in that complaint the full text of the post I attempted to make and a link back to this page. Also, be sure to advise us here on this page of your complaint. Martin Luther King: Assassination Tapes was broadcast on Australia's SBS on 7 December and is still available on demand until 20 December. This program reveals much about black labour and civil rights struggles that the Reverend Martin Luther King helped to lead. It shows how Dr King appealed passionately that black Americans protest their grievances through peaceful methods only and appealed to angry black youths to cease their destructive looting of shops and attacks on police. Nevertheless, the program remains yet another cover-up of the conspiracy by the US military and Memphis Police department found in 1999 by a trial jury to have caused the murder of Dr Martin Luther King on 4 April 1968. That Martin Luther King was only one of four outstanding visionary and courageous American political leaders murdered in the 1960's, was not disclosed. Even though Senator Robert Kennedy featured a number of times in the documentary, his subsequent murder on 6 June 1968 was not mentioned. Nor was mention made of the prior death of Robert's elder brother, President John F. Kennedy on 22 November 1963. No mention was made of the attempts by New Orleans District Attorney Jim Garrison to bring President Kennedy's murderers to justice as dramatised in Oliver Stone's epic film JFK of 1991. The murder of that other outstanding black American leader of the 1960's Malcolm X on 21 February 1965 was not mentioned either. I agree that it is pretty poor that a major documentary failed to mention that a civil trial exonerated James Earl Ray, who was convicted of the assassination and died in prison. This lack of compassion and accuracy erodes the overall value of the film. If, however, you have the background information provided by this article, for example, the documentary on SBS is quite striking and thought provoking. It shows absolutely massive solidarity among US blacks organising for industrial rights. As Geoffrey Taylor reminds us, in his comment above, no less than four assassinations (including King's) of civil rights defenders occurred close together in this period in the United States. With those assassinations it seems that coherent social movements to raise US workers' rights and poor peoples' access to the public wealth also died. Watching these records on film you get the impression of an utterly different country from today's United States, with clear conflicts and clear solutions, bearing more hope of solidarity than now exists. The US today seems like the country of every man for himself, where wealth trumps human rights. These pages get huge amounts of reads on candobetter. It would be great to have some articles from Americans about this time and its consequences. The Conspiracy to kill Martin Luther King: Not a theory but a fact from Global Research, 4 April 2013. That's not just some wing-nut conspiracy theory. It's not a theory at all. It is a fact, according to our legal system. The above was posted to johnquiggin.com. On 20 October 2011, a comment, which concerned this topic, was deleted from that site. Other posts, the contents of which been labeled 'Conspiracy Theory', have also been censored.